Crushed red pepper is a staple in our house, and we use it on everything! It’s super easy to make your own organic red pepper flakes using fresh peppers from your garden or the store. 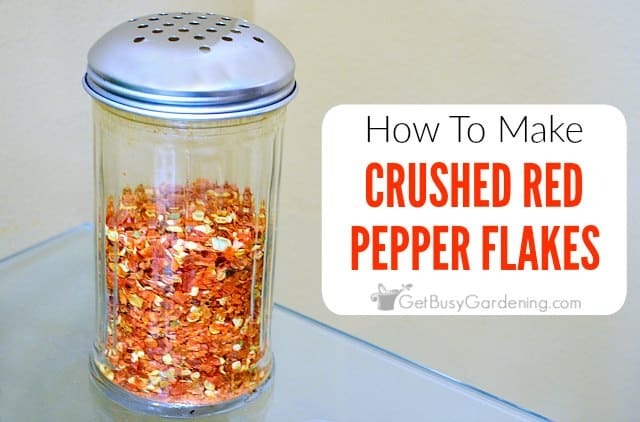 In this post, I will give you tips for how to dry hot peppers, and show you exactly how to make crushed red pepper flakes step-by-step. Hot red pepper flakes can be used to spice up just about any recipe, and taste great with everything. You can add it to recipes using crushed red pepper flakes, or simply sprinkled it over the top to give your favorite food some extra kick. It’s very easy to make your own organic crushed red pepper, and a great way to use up all those hot peppers from your garden. We love it and use it all the time! What Kind Of Peppers Are Used To Make Crushed Red Pepper? Traditionally, dried crushed red pepper is made using cayenne peppers. 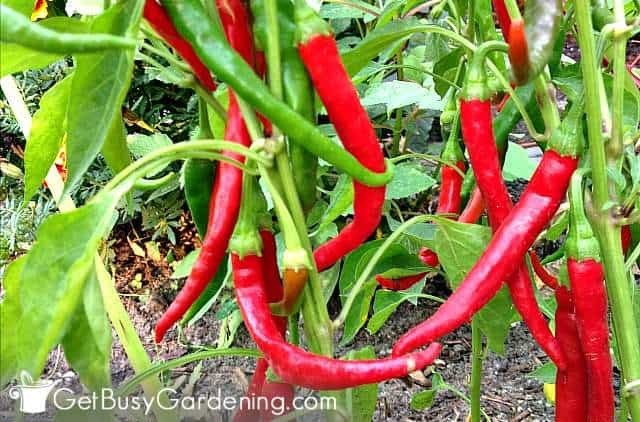 Cayenne peppers are not only the best peppers for crushed red pepper, they are one of the easiest, most prolific peppers to grow in the vegetable garden. I usually use cayenne peppers to make my dried red pepper flakes, just like the stuff you see at your local Italian restaurant or pizza joint. We’ve mixed in other hot peppers before too, and it works great. You could use any type of hot pepper you grow in your garden to make crushed pepper flakes, it’s really up to you. If you want to make extra hot crushed red pepper, try mixing in some habanero or ghost peppers! The very first step you have to take in order to make your own crushed red pepper is to thoroughly dry the peppers. Make sure the peppers are completely dry before crushing them. If they’re too wet, they won’t crush well. They also won’t store well, and could mold pretty quickly if there’s too much moisture left in the peppers. So be sure to give them plenty of time to dry before you crush them. Cayenne peppers can be left out to dry on their own. Many people like to do this by putting the peppers on a string, and hanging them until they’re dry. The peppers will take several days to completely dry out this way, so this is definitely the slowest of the three methods. If you choose to use this method, be sure to cut the tops off and cut the peppers in half, otherwise they could mold inside. 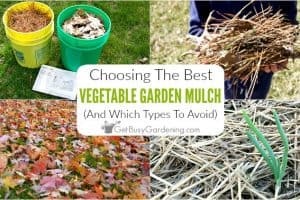 This works best if you live in a dry climate. But, if you live in a humid climate like I do, then it can be challenging to dry peppers this way. So, I would recommend either drying them in the oven, or using a food dehydrator rather than air-drying them. 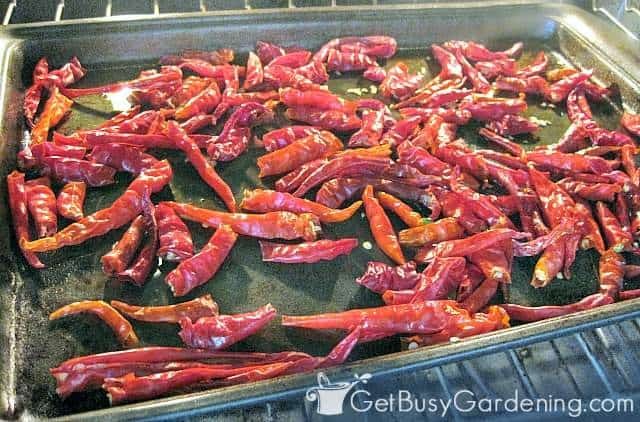 Drying cayenne peppers in the oven is easy, and I use the same method to make sun dried tomatoes. This is the fastest way to dry peppers for making crushed red pepper, and it’s my preferred method. All you have to do is cut the tops off of the peppers, and spread them out on an ungreased cookie sheet. Then put them into a preheated oven on it’s lowest temperature setting (I use 200 degrees F for mine) until they are dry. It takes a few hours for the peppers to completely dry out in the oven. 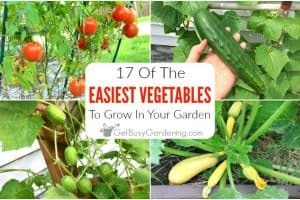 Keep an eye on them and be careful that you don’t overdo it though. Last year we burned a batch a little bit, but once they were crushed, they tasted fine. When the peppers are completely dried out, they will be brittle and break apart easily. If they’re still soft, then put them back into the oven. You want to be sure that all the moisture is out of the peppers, otherwise they won’t crush very well, and they may mold. 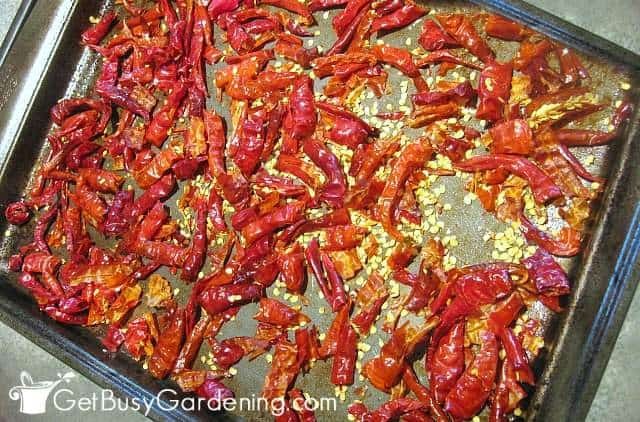 Using a food dehydrator is another great way to dry peppers. It takes a few days for the peppers to dry out completely using this method, but it’s still faster than air-drying them. Before dehydrating cayenne peppers, cut the tops off and slice them in half. 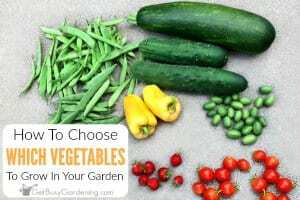 Then set your dehydrator on the “vegetables” setting to for drying peppers. If yours is like mine and the racks have holes in them, then I recommend using dehydrator sheets. Otherwise, the pepper seeds will end up making a mess at the bottom. Of course, it’s not that hard to clean them up, but the sheets will make your life a little easier. Besides, the seeds make the cayenne pepper flakes even hotter so you don’t want to lose those. 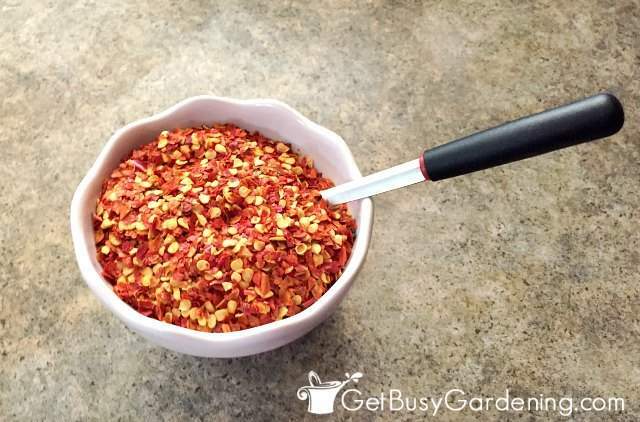 Once the cayenne peppers are completely dried out, use a mini food chopper to crush them into red pepper flakes, seeds and all. 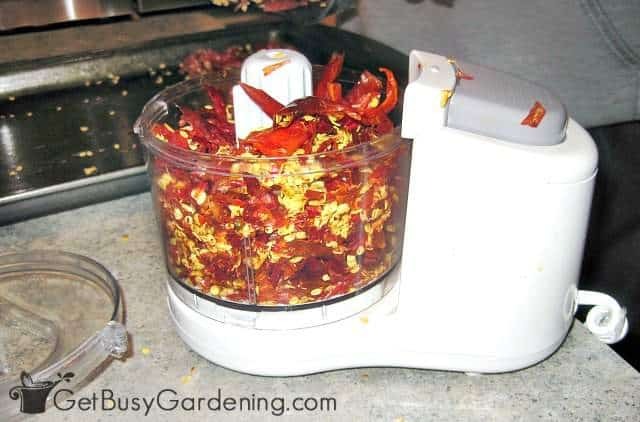 A larger food processor would work great too, especially if you have a big batch of peppers to grind. But don’t try to use a coffee grinder as your crushed red pepper flake grinder, or you’ll end up with red chili powder instead. After the cayenne peppers are crushed, it doesn’t look like you get very much out of the deal… but you don’t need to use much crushed cayenne pepper to add lots of spice to a recipe. So you will find that a little will go a long way! You can use your ground red pepper flakes right away, or you can a store them for later use. 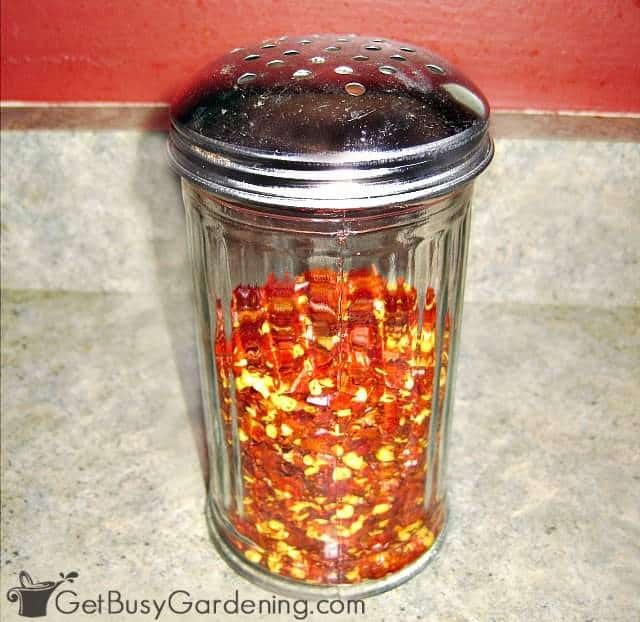 I store mine right in my crushed red pepper shaker, just like they do at the restaurant. Crushed pepper flakes can be stored in the refrigerator for several months, or you can freeze them for longer term storage. 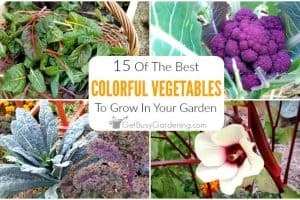 We store ours in the fridge, and it usually lasts us through the winter easily. 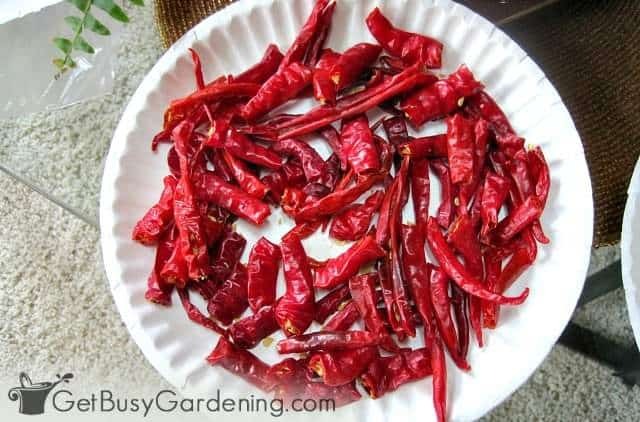 Once we start harvesting cayenne peppers again in the summer, we toss any left over dried pepper flakes into the compost bin, and replace it with a fresh batch. If you don’t know what to do with all those hot peppers you grow in your garden, try making your own crushed red pepper. It’s easy to do, and a great method of preserving cayenne peppers too. Remember, you could do this with other peppers too. This year, we dried a mix of different types of red peppers we had left over from the harvest in addition to the cayenne peppers. Just keep in mind – the thicker the pepper, the longer it will take to dry. 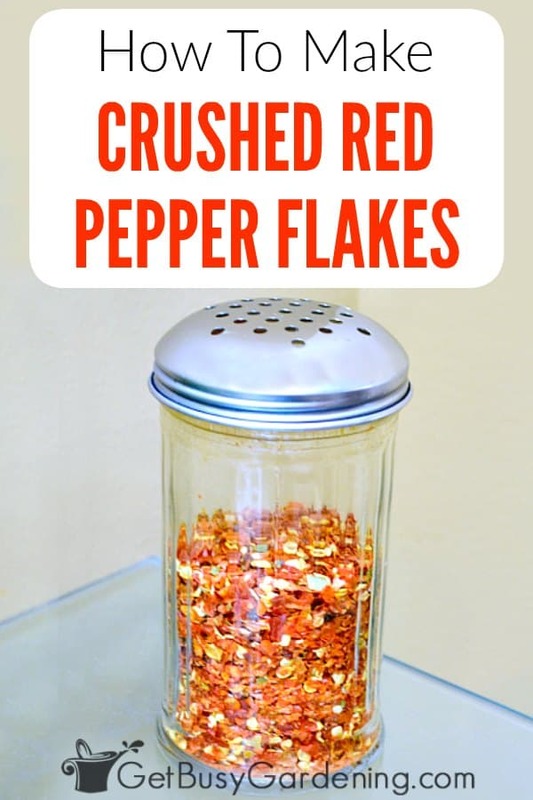 Share your tips for how to make crushed red pepper flakes in the comment section below. Great idea. The finished product looks wonderful. Have a friend who is looking to get rid of her jalapenos…. viola! Perfect! She can definitely dry them and crush them too. Jalapeños will take a bit longer to dry than cayenne peppers though. What do you do if your cayennes were picked but are all still green?? You can still use your green cayenne peppers to make crushed pepper flakes, they just won’t be as spicy as they are once they turn red. What precautions would you take when crushing your peppers? I just did mine in a food processor, I recommend wearing a mask and goggles. I took the top off and had pepper dust up my nose. My eyes burn a bit too. Wearing a mask and goggles is a great idea! Crushing and using hot peppers always makes me cough and sneeze too, LOL! I also recommend wearing gloves when handling hot peppers, and never touch your eyes or face. I wait until the dust settles a bit before opening the lid, then carefully pour the crushed red peppers into the container. How does the heat of your crushed pepper flakes made from cayenne peppers compare to common store-bought/restaurant type crushed red pepper flakes? Thank you! For my family I think I should find a different kind of pepper that’s not as hot, but I do want to imitate your fresh, homegrown approach.